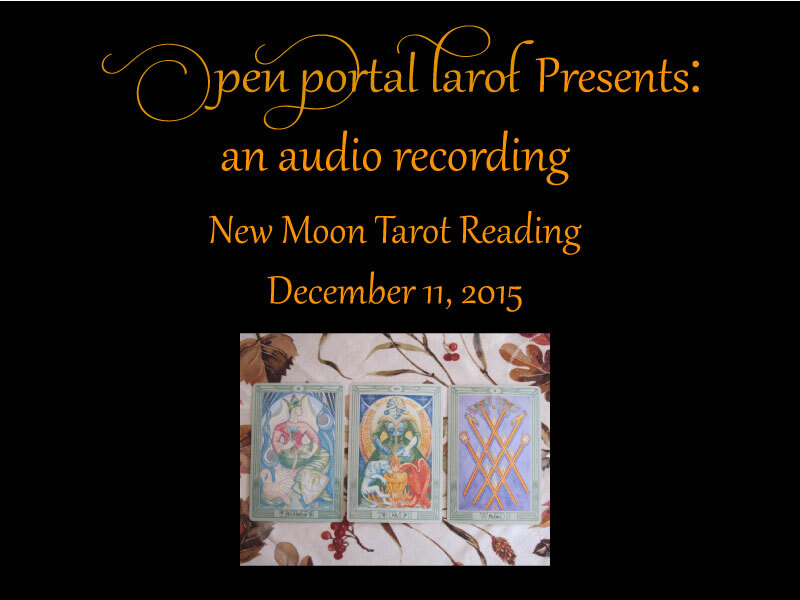 For an audio-recording of this reading, click here. Summary: This New Moon in Sagittarius supports using/developing inner sensitivity to metaphysical stimulus, a selfless use of the same to generate blessings, and a harmonious quality to life which results from such practices. The archery symbols that are built into the chest of the central figure in Trump XIV are important symbols through which this New Moon sends its support to the Heart. Not only is this New Moon in Sagittarius, the sign of a masculine archer, but also the central figure in Trump XIV has an arrow over her heart, symbolic of goddesses such as Artemis and Athena. She also has multiple breasts showing over her garment’s low neckline, further specifying Artemis who became merged with the Roman goddess Diana, thus blending the attributes of both. In light of the question posed to the Tarot, the arrow over the Heart of the central figure deserves careful attention. First, the arrow is pointing upwards, the way statues of Artemis show her with bow and arrow aiming upward. There is a goddess ritual that survives from pre-Christian times called “Drawing down the Moon,” which is alluded to by Artemis’ upturned bow. The purpose and end result of this ritual includes feeling in better connection with the Goddess of the Moon or with the lunar aspects of the self, according to one’s spiritual orientation. So, this New Moon invites the Heart to call on it to strengthen the connection and develop the pathway for the flow of energy. Second, the arrow alluding to Artemis-Diana merits further discussion of this goddess’ virginal quality. In the state of chastity, Artemis the archer could focus on that which was not a romantic distraction, namely finely adjusting the string of the bow to a precise tension. As an embodiment of that precision, statues of Diana show her standing straight with a staring yet benevolent gaze, hands outstretched with palms upward to give blessings, as if she herself were a bowstring with a carefully adjusted tension. The tension of attunement to both the divine flow of energy and the natural world of service were her primary focus. And the result? Just as Artemis-Diana herself embodied the qualities of a powerful, “mastercrafted” weapon, so also was her temple in Ephesus one of the Seven Wonders of the ancient world, originally housing a black meteorite, where a large number of ancient people were able to empower themselves through Artemis-Diana’s blessings. This New Moon invites the Heart to explore this level and type of power through attitudes of chastity that heighten spiritual attention within. If chastity has already been a spiritual discipline, then the springboard to harnessing more lunar strength is already present. Setting an intention about lunar worship in the time that leads to the next Full Moon could be timely. The cards to the left and right of the central card further sanctify the Heart’s work on Artemis-Diana themes. Trump III depicts more goddess qualities. The central figure sits calmly and regally in the midst of the plants and vegetation around her. In short, she is like a passive doorway through this natural thicket. She nurtures her devotees with her blessings, like a mother. Her pregnancy is a symbol of motherhood and the pelican feeding its young with its blood is also a symbol of motherhood. 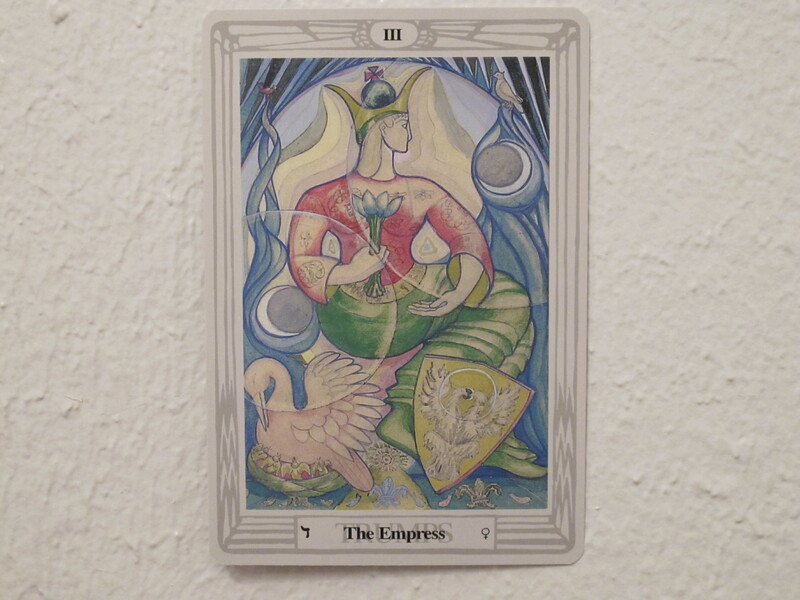 Mother goddesses represent selflessness, and this card’s association with the alchemical white tincture also represents a selfless state arrived at through effort. The way the figure looks towards the spread’s central Artemis-Diana figure forms a bridge between the ability to give blessings like a world mother and the power accumulated through introspection and connection to nature. 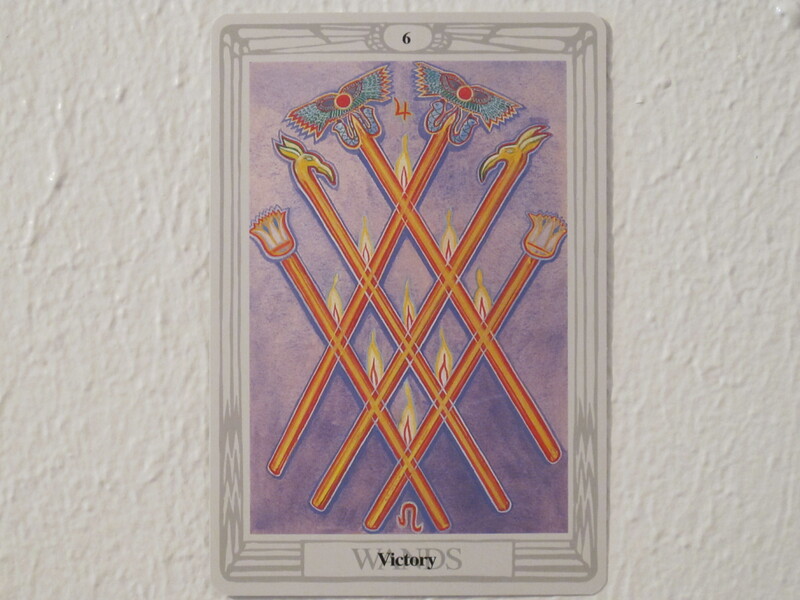 To the right, the 6 of Wands depicts a state of being arrived at through effort, in which there is healing and harmony. 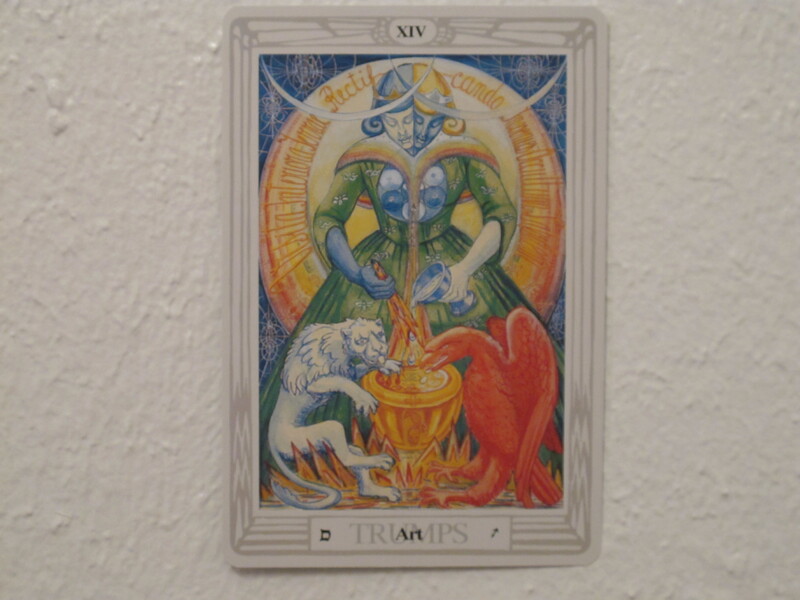 From a Qabalistic perspective, this card represents the suit of Wands’ version of the sixth sephira Tipareth, which is positioned in the Tree of Life in such a way that the other sephiroth below the abyss orbit around it harmoniously. It is like the Sun with the planets orbiting around it. In the psyche, this state of harmony does not happen without conscious attention, because inner qualities have to be understood and brought into connection, like a pantheon of gods and goddesses. However, the methods to do so are not commonly practiced. This conscious state of harmony goes hand in hand with the Artemis-Diana work of the central card. 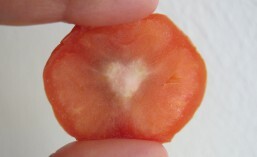 It shows how much stands to be gained by allowing the Heart to journey further into connection with the Moon. Here is a simple goddess chant that can be repeated to go forward with this spread. There are more substantial Moon invocations and full rituals, but this is a good stepping stone. It can be chanted to a slow rhythm of eight counts. It has a little tune that I chant it with. Isis, Astarte, Diana, Hecate, Demeter, Kali, Inana. This entry was posted in astrology, new moon, ritual, spirituality, tarot and tagged 6 of Wands, Artemis, astrology, Diana, new moon, ritual, spirituality, tarot, Thoth Tarot, Trump III, Trump XIV. Bookmark the permalink.